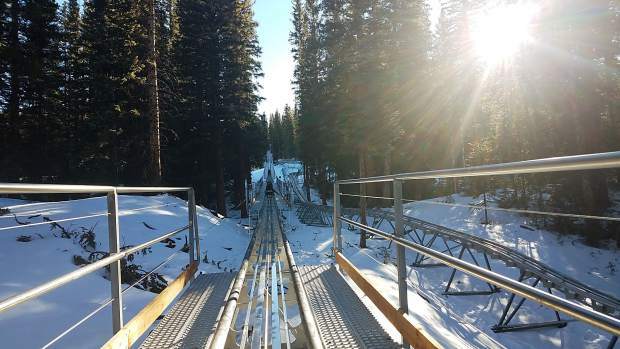 Snowmass' Breathtaker Coaster opened Sunday. There is a new thrill in our hills, and it has a pretty strong gravitational pull. Snowmass’ long-awaited Breathtaker alpine coaster opened to the public Sunday, and after a morning of going downhill at Ajax, the pull from the other side of Burnt Mountain was too great. With the reminder that the Broncos-Jets game was without merit, I ventured over to the Lost Forest. I’m an alpine slide/coaster/bobsled aficionado, and part of me wanted history to show I rode the Breathtaker on its official opening day. This passion started with running my Big Wheel down a toboggan run at Charles Dorais Park during early-1970s summers in Detroit. I sport a scar on my left thumb from a late-1970s incident at the alpine slide at the Broadmoor, back when shallow fiberglass flumes were host to plastic sleds with a sketchy one-lever braking system. I was nearly banned for the day from the alpine slide at Heritage Square for blowing past a “Slow” sign and catching air off a drop on the upper section of the flumes near Golden. With the help of Olympic hopefuls giving us a push, my brother-in-law and I a few years ago recorded one of the fastest times on The Comet bobsled ride at Utah Olympic Park in Park City. Different from its predecessors, an alpine coaster is a mashup of the old-school alpine slide and amusement park, tube-style roller coaster. Oh, and there’s no long, slow ride on an old double-chair lift and schlepping your cart to the track. The Breathtaker crew was studious Sunday, making sure anyone unfamiliar with the process was well-informed before being pulled up the track. After a quick lesson on how to brake and a seatbelt check, it was thumbs-up for the slow ride up. From the top, there’s no stopping in transition. The 5,800-foot long track certainly has its moments, including the corkscrew section, which I think is modeled after trying to get out of the Base Village parking garage, and then the lower section with some fun, quick drops. Is it fun? You bet. Is it $19 worth of fun? Meh. As with any slide, the ride is only as good as the person in front of you. Going screaming down the track is at the mercy of the sled ahead. I’ve been behind people who you wonder why they even paid for a thrill ride when they treat the sled like a 1914 Model T on a Sunday drive in the country. I made it nearly two-thirds of the way down before I had to hit the brakes to keep distance between me and the sled ahead. It was in that final third I realized it was about spending a nice quiet Sunday on the mountains — until I had to pay another $5 to go spinning out of the parking garage.